It’s back-to-school season once again—an exciting but often stressful time. Did you know that this time of year can be just as hard on your canine friends as it can be for your kids and the rest of your family? If your dog is used to having a house full of people—especially young, energetic people to play outside and run with each day—then the sudden absence of those people can be jarring for your dog and might result in some unexpected bad behavior. Looking for some ways to help your dog cope with back-to-school separation anxiety? We’ve got some suggestions. Starting the day with a quick walk and high-energy game is a great way to help your dog with separation anxiety. That’s because if your dog comes back from the walk a bit on the tired side, she’ll rest instead of being restless. Before you leave, say goodbye to your dog, but try to avoid exciting him too much right before you leave the house. If he’s already lying down after his morning exercise, then don’t ask him to get up to see the kids out the door. Better to let the sleeping dog do just that, so he’ll stay calm and relaxed when the house is quiet. If your dog is new to your family, don’t expect him to be thrilled to see you after you’ve been gone all day. He may be very excited to see you or your kids when you first come home, or he may take some time to warm up to you if he’s felt abandoned. If he’s slow to warm up, start with positive reinforcement by greeting him calmly and with normal or quiet voice and a gentle ear or back rub (model this for your kids before the first day they’ll home after school). Then give your dog a little space. After 5 minutes or so, ask him if he’s ready to go on a walk. If your kids are old enough, you can teach them to follow the same steps to help a newer dog or a more anxious dog get comfortable with what it means for his people to come home each day. Some dog owners choose to leave the radio on during the day for their dogs who don’t cope well with being left alone. Hearing human voices can be comforting to anxious dogs who are used to hearing people talking throughout the day. 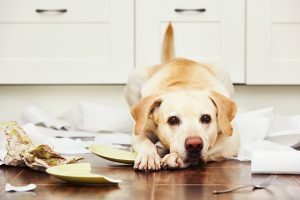 If your dog seems to be acting out in unusual ways after the kids are back in class, then that could be an indication of larger behavioral issues at play. Click here to find out more about what our private and group dog-training classes and dog-behavior experts in Overland Park can do for dogs who’re suffering from separation anxiety.